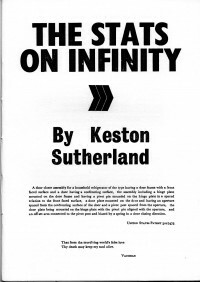 I don’t know how familiar readers of this site will be with the work of Keston Sutherland, the British experimental poet sometimes associated with the Cambridge and New York “LANGUAGE” schools of poetry (though Sutherland’s work squirms uneasily under any attempt at definition in terms of school/genre/whatever). Sutherland’s poetry is difficult. A video of Sutherland reading his long poem Hot White Andy is a good introduction to his work: intense, surging and bewildering. He looks manic as he reads; the text is plosive and works through him, as though it is spilling out of his body rather than his mind, like Lucky’s monologue in Waiting for Godot, or the frenetic mutterings of Not I.